Democrats are fighting eight cabinet nominees and splitting Trump from GOP leadership on domestic issues. They could make a lot of trouble—and they should. It’s on: The 115th Congress convenes Tuesday, new members are being sworn in, and Democrats seem ready to fight President-elect Donald Trump, his plutocratic cabinet nominees, and his agenda. We actually don’t know what his agenda is, but that doesn’t matter: House Speaker Paul Ryan is ready to make his agenda Trump’s agenda, and the president-elect is too busy threatening North Korean leader Kim Jong-un, complaining about President Obama, praising Russian president Vladimir Putin, and mocking his “enemies” on Twitter to tell us whether he’s willing to sign his name to Ryan-crafted budgets that punish the poor to benefit the wealthy. House Republicans flexed their new muscles by eliminating the independent Office of Congressional Ethics late Monday night, and established a new body that reports to the House Oversight Committee, where ethics complaints against members of Congress often go to die. But after a backlash from Democrats—and even a tweet from Trump questioning the House GOP’s timing if not its goals—they reversed course. Democrats will have lots of opportunities to contrast Congressional Republicans’ right-wing supply-side agenda with Trump’s campaign pledge to support workers, protect the safety net, and bring back jobs. But first, there’s the task of confirming—or rejecting—Trump’s cabinet nominees. After the shock of the election, there was a lot of talk about Democrats’ having to “pick their battles” and choose one or two nominees and policy proposals to oppose vigorously while looking for chances to work with the incoming president. Trump’s extremist cabinet picks and his alarming volatility during the transition seem to be strengthening Democrats’ spines to fight more broadly. 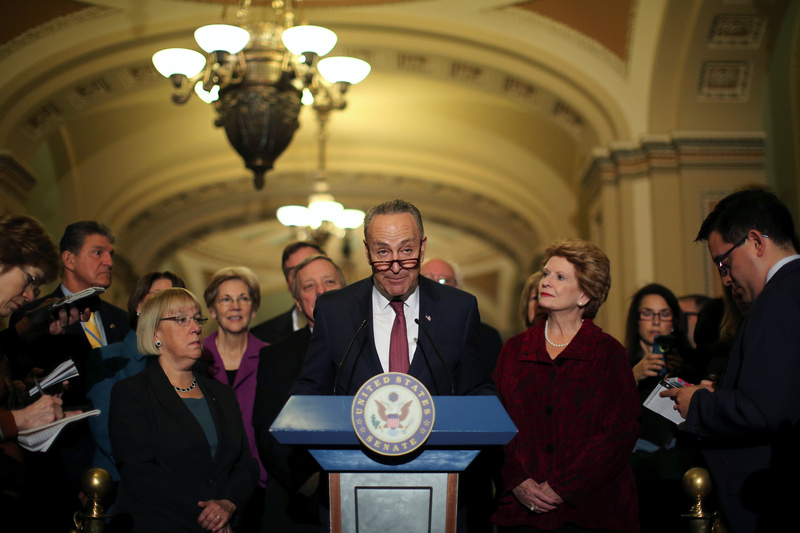 After worrying progressives with early signals of conciliation toward Trump, Senate minority leader Chuck Schumer is signaling that Democrats will battle up to eight of his cabinet selections, according to The Washington Post. He told majority leader Mitch McConnell to expect a long fight on Senator Jeff Sessions (R-AL), Trump’s attorney general nominee, Exxon-Mobil head Rex Tillerson, his pick for secretary of state, Rep. Mick Mulvaney (R-SC) to lead the Office of Management and Budget, and education-ecretary nominee and school privatizer Betsy DeVos from Michigan. Additionally, Senate Democratic aides have told reporters there will be harsh scrutiny of other picks whose pasts put them in opposition to the agencies they will run: Obamacare critic and Medicare privatizer Representative Tom Price (R-GA), Trump’s nominee to run the Department of Health and Human Services; fast-food mogul Andrew Puzder, who supports robots replacing American workers and opposes a minimum wage, as labor secretary; former Goldman Sachs partner Steve Mnuchin, who ran a foreclosure mill at One West Bank, as Treasury secretary; and Oklahoma Attorney General Scott Pruitt, a strong opponent of the Environmental Protection agency, to run—what else?—the EPA. The Sessions nomination hearing will set the tone for how hard Democrats are willing to fight Trump. Schumer alarmed progressives by noting that he works out in the Senate gym next to Sessions, while saying that he will nonetheless give him close scrutiny—it seemed to imply the opposite, and that Senate clubbiness might overrule the serious concerns about Sessions’s fitness to be the nation’s top law-enforcement official given his history of prosecuting voting-rights advocates in Alabama. Progressives are also concerned about the inadequate confirmation materials the Alabama senator has provided to the Judiciary Committee. The civil-rights groups Alliance for Justice, the NAACP Legal Defense Fund and People for the American Way prepared a memo in mid-December showing that Sessions had omitted hundreds of speeches, opinion pieces, and interviews when answering his Senate Judiciary questionnaire. Maybe the most serious omission was his rejected 1986 nomination for the federal bench, which was a required disclosure, since the questionnaire asked for “all unsuccessful candidacies you have had for elective office or unsuccessful nominations for appointed office.” Sessions was rejected by a Republican Senate for his history of wrongly prosecuting voting-rights activists for alleged “fraud,” and for racial comments colleagues quoted him making over the years. After the critical memo, Sessions updated his questionnaire, but he has still not disclosed many speeches, interviews, and op-eds, some of them as recent as October and November. (Interestingly, most of his interviews with alt-right Breitbart News, formerly run by Trump chief strategist Steve Bannon, are also missing from his disclosures.) The NAACP Legal Defense Fund caught Sessions in Trump-like hypocrisy, digging up a quote from the 2010 confirmation battle of judicial nominee Goodwin Liu, attacking the nominee for submitting an incomplete Senate Judiciary Questionnaire. “[Liu’s] unwillingness to take seriously his obligation to complete these forms is potentially disqualifying and places his nomination in jeopardy,” he wrote then. He later claimed Liu could face felony charges for the omissions. Jeff Sessions 2010 ought to have a word with Jeff Sessions 2017. The Judiciary Committee’s ranking Democrat, Senator Dianne Feinstein, has already asked committee chair Senator Chuck Grassley to postpone the Sessions hearing, which is set for January 10. Grassley said no, but Democrats are still pushing.“The whole idea is to have a meaningful hearing, where senators and their staff get the materials well in advance,” said Sherillyn Ifill of the NAACP Legal Defense Fund. “What’s most troublesome is how much of the material [Sessions omitted from his questionnaire] was easily findable and obtainable. So will this be a real hearing about his fitness to serve as the nation’s chief law enforcement officer, or will it be a pageant?” There are also concerns about how much time will be allowed for testimony. Schumer has been pushing for extra time; McConnell has scoffed at that. “Our committees and chairmen are fully capable of reviewing the incoming Cabinet nominations with the same rules and procedures as the same committees did with President Obama’s nominations,” McConnell spokeswoman Antonia Ferrier told the Post. Sessions isn’t the only Trump nominee that is providing inadequate data. Tillerson won’t release the tax returns Democrats want, which could help document his extensive ties to Russian energy businesses as well as his Exxon-Mobil interests; Republicans say they won’t force him to disclose that information. But Republican Senators John McCain, Lindsey Graham, and Marco Rubio are also expected to grill Tillerson. Others nominees, like Sessions, filled out incomplete committee questionnaires, irritating Democrats and even a few Republicans. As Politico reports: “The earliest ethics agreement for one of the seven nominees confirmed on Obama’s first inauguration day was filed on Dec. 22, 2008, and the latest on Jan. 8, 2009.” None of Trump’s picks have completed all of their ethics-disclosure requirements. Some analysts suggest a concerted Democratic pushback on Trump’s nominees could delay the House GOP’s sweeping right-wing agenda into the spring. Let’s hope so. But whenever that agenda does roll out, Democrats will have an opportunity to showcase how it differs from the platform Trump won on—which got him that crucial 80,000 vote win in Wisconsin, Michigan, and Pennsylvania. Trump promised to protect Social Security, Medicare, and Medicaid—which Ryan and his HHS nominee Tom Price have in their sights. He promised to repeal Obamacare, for sure, but also to replace it with “something terrific.” That something isn’t forthcoming from the House GOP, which is likely to try to simply repeal the Affordable Care Act, and then promise to “replace” it—and it won’t be “terrific”—after one of the next elections. So Democrats have an opportunity to separate Trump, and his voters, from the establishment conservative GOP that he defeated in the Republican primaries. They also have a chance to split Trump from leading Republicans in the Senate over the issue of Russian interference with the election, which Trump appears to deny, while McCain, Graham, and even McConnell believe it happened. But these domestic issues, along with the plutocratic pedigree of his cabinet nominees, are likely to matter more to Trump voters. I’m mildly encouraged by the rumblings from Democrats over the last week. Early promises to work with Trump where possible have given way to a steeliness born of realism that the vast majority of his moves are going to have to be fought. We’ll see who has the spine to do that. To end on a positive note, Tuesday saw the addition of a dozen new Democratic women to Congress, all supported by Emily’s List, including four new female senators. Seven are women of color. All are known as fighters. They’ll add welcome new energy in a dark time.